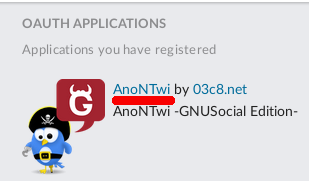 30/11/2016: Anontwi has been added to GNU (fsf.org). 20/08/2015: Added support for GNUSocial. 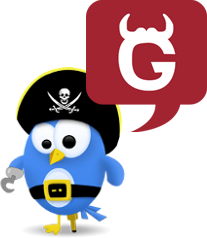 14/05/2015: Added support for New API of Twitter (v1.1). layers of encryption and privacy methods. Software Foundation version 3 of the License. + To use OAuth you need this tokens: 'consumer key' and 'consumer secret'. 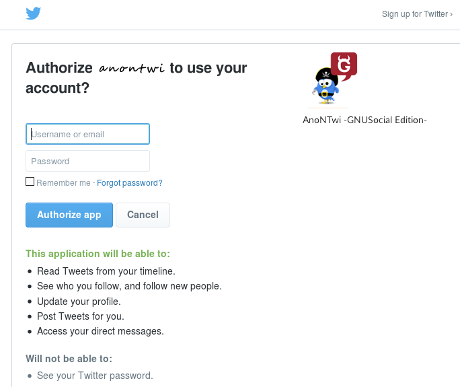 - Click on: "Register an OAuth client application"
- Click on: "Register a new application"
-> You must enter a unique name, no entered by others before. - Click on: "Create New App"
* For connect using TOR add: --proxy "http://127.0.0.1:8118"
+ To use OAuth you need this tokens: 'token key' and 'token secret'. - Follow the link to read your "PinCode"
- To launch TOR, add this command: --proxy "http://127.0.0.1:8118"
Share this key privately with the recipients of your encrypted messages. Don't send this key over insecure channels such as email, SMS, IM or Twitter. Launch it and you will have a bot slave waiting your orders on IRC. 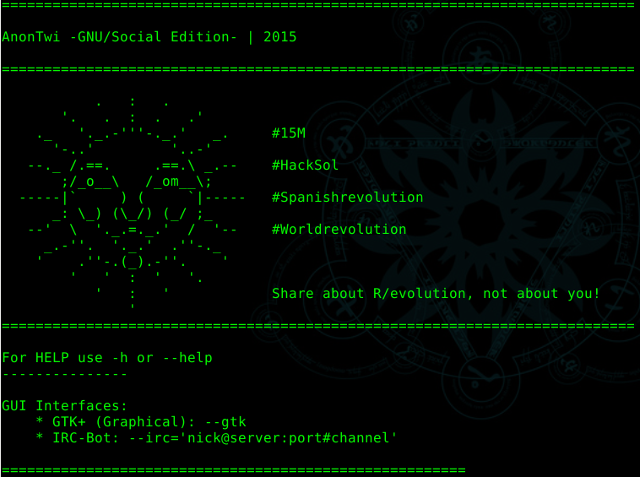 ./anontwi --short "url" --proxy "http://127.0.0.1:8118"
./anontwi -m "Hello World" --proxy "http://127.0.0.1:8118"
./anontwi -m "Hello World" --enc --pin "K7DccSf3QPVxvbux85Tx/VIMkkDkcK+tFzi45YZ5E+g="
You need the ID of the tweet that you want to remove. 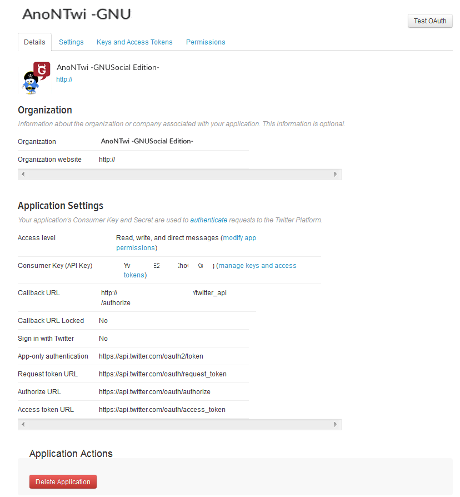 - launch "--tu @your_nick 'num'" to see tweets IDs of your timeline. 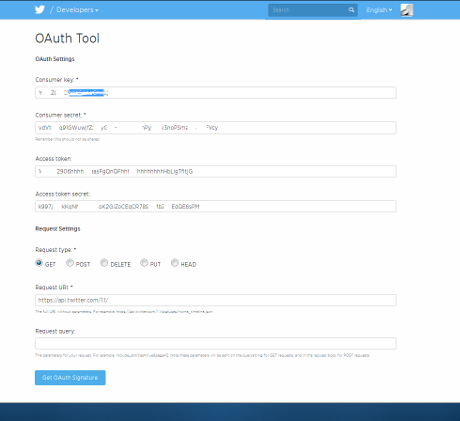 You need the ID of the tweet that you want to RT. - launch "--tu @nick 'num'" to see tweets IDs of a user. ./anontwi -m "See you later" -d "@nick" --proxy "http://127.0.0.1:8118"
./anontwi -m "See you later" -d "@nick" --enc --pin "K7DccSf3QPVxvbux85Tx/VIMkkDkcK+tFzi45YZ5E+g="
You need the ID of the DM that you want to remove. - launch "--td 'num'" to see Direct Messages IDs of your account. 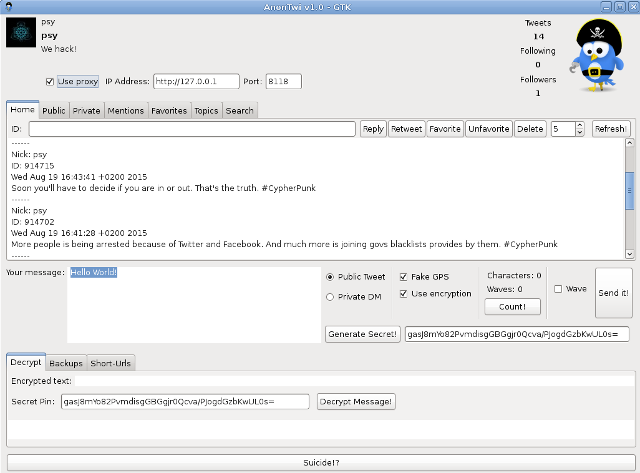 ./anontwi -m "https://host/path/file.jpg" --proxy "http://127.0.0.1:8118"
You need the ID of the message of the conversation. 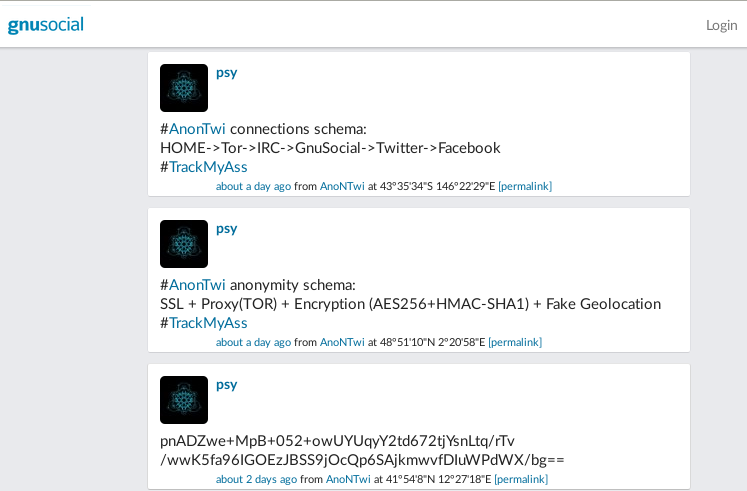 - launch "--tu @nick 'num'" to see tweets IDs of a user timeline. - launch "--tf 'num'" to see tweets IDs of your 'home'. Add names of users that participates on conversation at start of your message. ./anontwi -m "@user1 @user2 text" --reply "ID" --proxy "http://127.0.0.1:8118"
./anontwi -f "@nick" --proxy "http://127.0.0.1:8118"
./anontwi -u "@nick" --proxy "http://127.0.0.1:8118"
./anontwi --fav "ID" --proxy "http://127.0.0.1:8118"
./anontwi --unfav "ID" --proxy "http://127.0.0.1:8118"
./anontwi --block "@nick" --proxy "http://127.0.0.1:8118"
./anontwi --unblock "@nick" --proxy "http://127.0.0.1:8118"
Very usefull if you want to send long messages. It uses Twitter restrictions as much efficient as possible. ./anontwi -m "text" --gps "(-43.5209),146.6015"
./anontwi --me "1" --proxy "http://127.0.0.1:8118"
./anontwi --dec "http://twitter.com/encrypted_message_path" --pin "K7DccSf3QPVxvbux85Tx/VIMkkDkcK+tFzi45YZ5E+g="
./anontwi --save "1000" --proxy "http://127.0.0.1:8118"
./anontwi --sfav "@nick 100" --proxy "http://127.0.0.1:8118"
This will try to delete your tweets, your DMs and if is possible, your account. 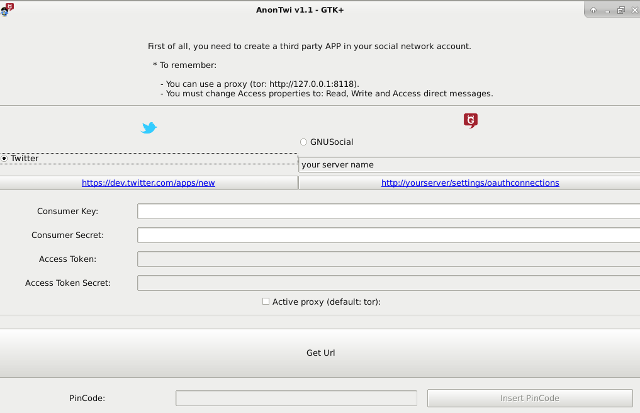 Image: AnonTwi GTK - Connected! 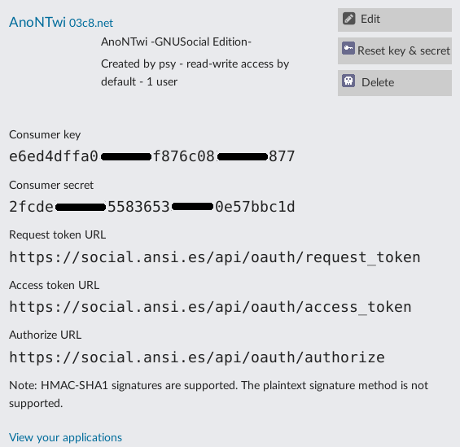 AnonTwi is released under the terms of the General Public License v3 and is copyrighted by psy. If nobody gets back to you, then drop me an e-mail. This -framework- is actively looking for new sponsors and funding. 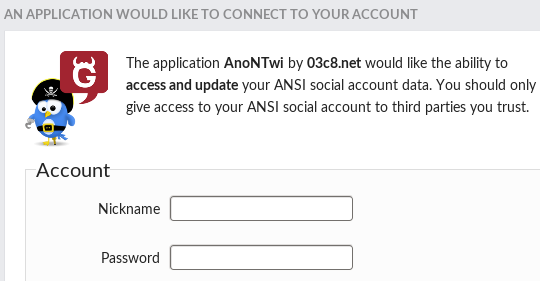 If you or your organization has an interest in keeping AnonTwi, please contact directly.